“Shaka ScrewLoose” is the first debut solo album by “Tno Tino”. He is one of the members of the hip hop/rap trio” Children Of Sin”. The group has one Ep, and two full albums available online and in store’s. 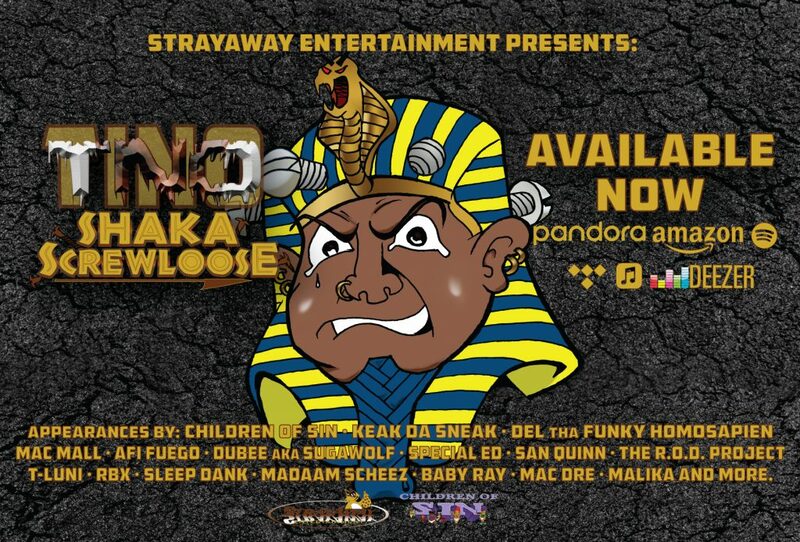 The “Shaka ScrewLoose” album is a mixture/fusion of authentic hip hop from the past ,present and even future. The album has appearances by: Mac Dre, Afi Fuego, Children Of Sin, Del, Keak Da Sneak, Madaam Scheez, Special Ed, Dubee, T-Luni, Malika, Sleep Dank, Baby Ray, Mac Mall, Loone Lane, Boondocks Of Da Bay, Malle Diamond and RBX. The production credits include music by: Uglyfingers, Press Play, Chris Cash, KU, Onitnas, Lodeph, Louieville Slugga, Boondocks Of Da Bay and Tno Tino. If you are a fan of good music with great quality, you will enjoy this album. StrayAway Entertainment always likes to give listeners more bang for their bucks, so enjoy!